I often find myself wanting to do something creative but feeling a bit uninspired, as if I’ve lost my creative mojo. I know I want to experiment with new products or to try new techniques but I can’t think of a solid idea for a specific project. On these occasions I try to make mini, one-step projects that are still creative but do not require any pre-planning. Therefore, I find these inspiration-twilight-zones perfect for a mini watercolor project. 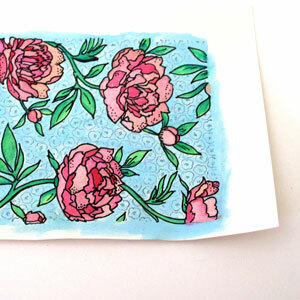 Simply stamp a background stamp with a water-resistant ink (such as Stazon) on watercolor paper and color away. Later you can use it as an element on a page or a card. Add some black details with a broad-tip pen for a bolder look. This one is a spin on watercoloring a stamped piece, for times you don’t feel motivated to break out the watercolors, water, brushes, etc. 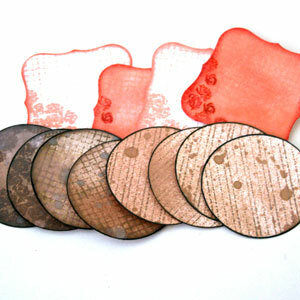 For that mini micro project you only need one ink pad, some cute, easy-to-cut stamps and any paper. When I shop for new stamps I always think of images I can stamp, cut and stow for later use… When the time comes to make an actual card, scrapbook layout, mini album or even to wrap up a gift – you would LOVE to have that stash of pre-cut images to use in a snap. After all, by the time you get really inspired, you want to use your precious time for designing cool stuff, not on technicalities, right!? This creative jumpstart performs a double duty: (1) It’s easy and does not require ANY pre-planning; (b) It’s an AWESOME way to use your scraps and if you are anything like me, you have a ton of them. I am not very good with the sewing machine (= that’s the understatement of the year). That humble stack of randomly sewn pieces is the combined effort of several mini-sewing-sessions, with months apart… Having said that, I really love the machine-stitched look. I think that it adds a new dimension and texture to any project, not to mention a more finished look. The great thing about machine stitched elements is that you can’t tell when they were carefully sewn on the project or added later as an afterthought… Which is why I think it’s so great to simply stitch random pieces of paper together. The time will come when those sewn panels and pockets and strips will perform their duty, honorably, on a future project. Make your own journaling spots. This is another great example of something small that you can do that gives you an opportunity to experiment with different techniques and stamps and can be very useful in the future. 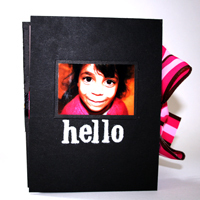 Either punch or die-cut your journaling spots in advance or stamp them first and cut around the stamp image. Then simply play with them => Add distress inks and stains, mist them, stamp on them, doodle, use letter and word stickers on them. Just have fun and experiment and get as messy or as tidy as you want. Finally, store them with the rest of your stash for later use. You may also use cuter and more tightly closed containers, if you so wish. I’m not sure I should say so myself…, but they are so useful. I almost always use a piece on every scrapbooking project I make. Having these ready-to-go pieces is making it much easier to use them. I don’t think I would ever start searching my file folders for a specific journaling labels set, then printing it and cutting it – all just for a specific journaling spot on a specific page of a specific project. I don’t think so. I am notorious for buying stamps just because they look cute. I admit it. I used to get them and not be exactly sure what to do with them. Oops. Sometimes I just add the cute image to the card base (as you can see on the right) and sometimes I stamp on a 5½” panel that I can add to a card later (as you can see on the left), with or without foam adhesive. Sometimes I also add Stickles, because I’m feeling extra sassy…, but shhh, please don’t tell. To finish up, I have another spin on the stamp-and-cut suggestion. Wait for it… it’s a die-cut-and-stamp suggestion. Did I tell you how ‘smart’ I am feeling today? Oh, I just did. Okay. Many brands offer combinations of stamp sets with matching dies. These are perfect for creating mini professionally-looking embellishments that you can use in so many different ways and on so many different projects. You only need a one-time investment in the dies and stamps set and that’s it. 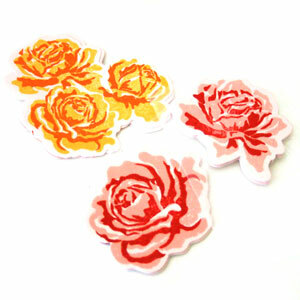 Each additional die-cut embellishment you create is practically free. Do you have other suggestions for creative jumpstarts that need no pre-planning, just some free creative time? If you do, please share in the comments section below! A few weeks ago I was contacted by Michael Cassidy of Rand Media Co. and asked whether i would like to receive a pre-released copy of “The Skinny On Creativity” for review. This book is part of a series of publications entitled “The Skinny On”. “In our time-starved and information-overload culture, most of us have far too little time to read. As a result, our understanding of important subjects often tends to float on the surface – without the insights of writings from thinkers and teachers who have spent years studying these subjects. The book “The Skinny on Creativity” is no different. It is well written in a very clear and concise way. At first glance I thought the book is too simplistic because of its unique style. However, I quickly understood the book is designed to be perceived differently by each individual who reads it. I can either read the snippets as they are conveyed and move on quickly or I can pause after reading each notion to ponder and contemplate about it. In other words, I can read it either very fast or very slowly, depending on what I wish to get out of this book and I absolutely love it. Not to mention that I may want to read it slowly at first but have the option to go through it quickly later on. 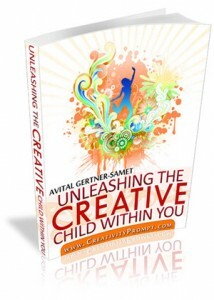 Before writing my own book, “Unleashing The Creative Child Within You”, I conducted an extensive research on creativity. I read a ton of books and essays and covered the subject of creativity from A to Z. Therefore the ideas presented in the book The Skinny On Creativity were not new to me, but still I could find a fresh outlook on these ideas by the connections the author made between them and the order he decided to put them on. I also enjoyed the humor the author injected to the otherwise very theoretical book. It made my reading much more joyful and several times it led me to an entirely different outlook on the subject matter. I think this book is perfect for someone who is looking for an extensive overview on the subject of creativity but without having the time for the extensive reading required. In addition, the wittiness and pithiness of the book are very inspiring and were actually honing my creativity while I was reading it. I kept coming up with new project ideas which is always a delightful characteristic in a book on creativity. Have you read any of the “The Skinny On” books? If so, what did you think about them? Have you read another good book lately that you’d like to recommend? Please share by leaving a comment on this post. I have recently received an e-mail from Emma Taylor of Accreditedonlinecolleges.com. She has graciously sent me a link to an article on her website: “25 Talks to Ignite & Unleash Your Creativity“. This article offers many sources of fire to ignite your smoldering creativity. I wrote “Unleashing The Creative Child Within You” while we were living in Dublin, Ireland. This e-book is, in a way, a travel journal. In it I reduced to writing the journey I had embarked on to find my own inner creative child. After leaving my country, my family, my friends, my job and my profession I found comfort in reuniting with my core creativity. My inner child embraced me with pure love, like only children know how. My inner child accepted me unconditionally, like only children (and moms) know how. Finding the joy of creativity again, recognizing the reasons I had lost it in the first place, was a marvelous gift I gave myself with this journey. In this e-book, which is available for immediate download as a pdf file, I will pave your way to your inner creative child, brick by brick. 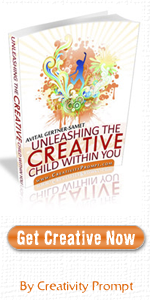 “Unleashing The Creative Child Within You” will explain why you became distant from your core creativity and will reveal the secret to getting it back. With exercises designed specifically to help you find the inner child within you, regain its confidence and unleash it – you are bound to get your mojo back faster than you think. An Artist Trading Card (aka: ATC) is basically a 2½” by 3½” piece of original artwork which is traded among artists. Participating in an ATC swap is a great way to express yourself creatively without being overwhelmed with a huge blank canvas. It is also a great way to get to know other artists and expand your artistic world. As soon as I heard that Hero Arts is arranging an ATC swap I knew I had to participate. On this week’s creativity prompt I want to walk you through the process of creating my ATC for the swap. 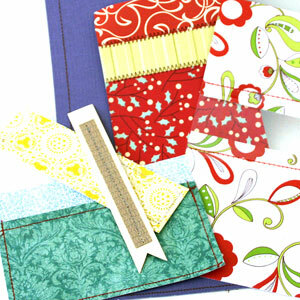 Cut your cardstock to the traditional 2½” by 3½” size. To make the most out of an 8½” by 11″ sheet of cardstock, start by cutting it at 2½” lengthwise twice and then you’ll end up with a 3½” strip. Adhere a vintage text paper (from an old book. I used an old text book about Roman Law…) to another piece of non-textured cardstock with a glue stick. 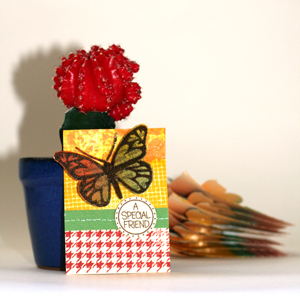 Color the vintage paper with distress ink using the foam applicator with a swirling motion, from the outside in. Blend a few colors together. I used: Broken China, Fired Brick, Peeled Paint and Mustard Seed. Stamp the heart winged butterfly image in dark brown ink over the colored vintage background. Try to stamp the images as close as possible, but leave a small gap between them. Let the ink dry completely. Mask off 2/3 of the ATC with a post-it note and stamp the houndstooth background stamp using one of the distress inks. Take off the post it and use it again, masking the part you’ve just stamped. Then stamp over it with the screen shadow stamp. Take a small piece of bubble wrap and apply a layer of distress crackle paint over it. Use the wet bubble wrap to “stamp” with it over the screen shadow background. Let dry. After the crackle paint is completely dry cover it with a thin layer of clear glue or glaze to prevent the paint from breaking and falling off. In the meantime stamp the circular greeting on another piece of non textured cardstock using the same dark brown ink (I used the Clear Design: Who Loves You – CL309 – stamp set by Hero Arts, but it is no longer available). Punch the greetings out with a 1″ circle punch. 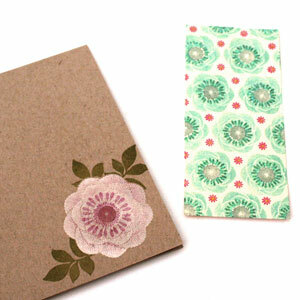 Cut a green textured cardstock to 2½” by ½” strips. Poke a line of holes, 1/8″ apart from each other, along the middle of the strip and “connect the dots” with a white gel pen. Adhere the strip to the border where the two different background patterns meet. Cut the butterfly images with precision scissors. I am using Fiskars spring action micro tip scissors and I absolutely love them. Cover the butterfly images with an embossing ink and dip it into a mix of 1 part glitter to 3 parts clear embossing powder. Set with a heat gun. 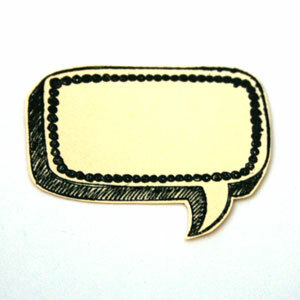 Attach the circular greeting to the cardstock strip with a foam dot. Attach the butterfly above the strip in an angle using some mini glue dots behind its body and some pop up glue dots behind its wings. Don’t forget to add your name, date and signature on the back! 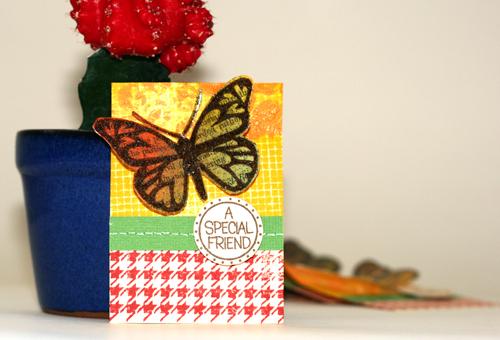 Have you ever participated in an ATC swap? 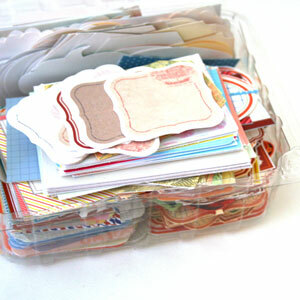 Are you interested in assembling an ATC swap group here on creativity prompt? If you are, please leave a comment and show your interest. For this week’s inspiration prompt I want to share a different kind of inspiration – creative inspiration. Sometimes no matter how hard we try we feel uninspired, blocked and cannot seem to come up with any new ideas or make anything that pleases us. Keri Smith, an amazing artist and author has compiled a list of 100 ideas that can help you rekindle an extinguished inspiration. 100 sparks of creativity, any of which can relight your fire. Take a look. Try some of her brilliant ideas. Try each and every one of her ideas, an idea a day. Have you tried any of these ideas? How do you fuel up your creativity? share by leaving a comment on this post.